November 1959. 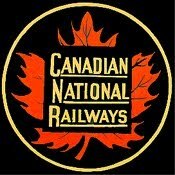 Canadian National Railways, Western Region, British Columbia District, Smithers Division, Nechako Subdivision, Fort Fraser Station, MP. 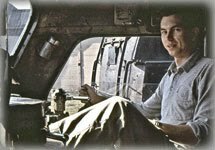 94.3. 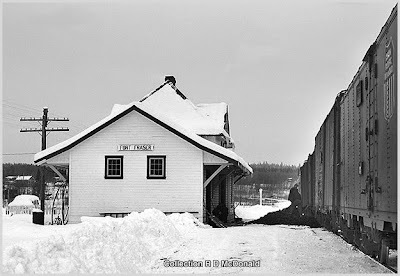 The agent at Fort Fraser station placed an order for coal to keep his station and quarters warm. And today is delivery day! Yup, the coal being shoveled right onto the platform! 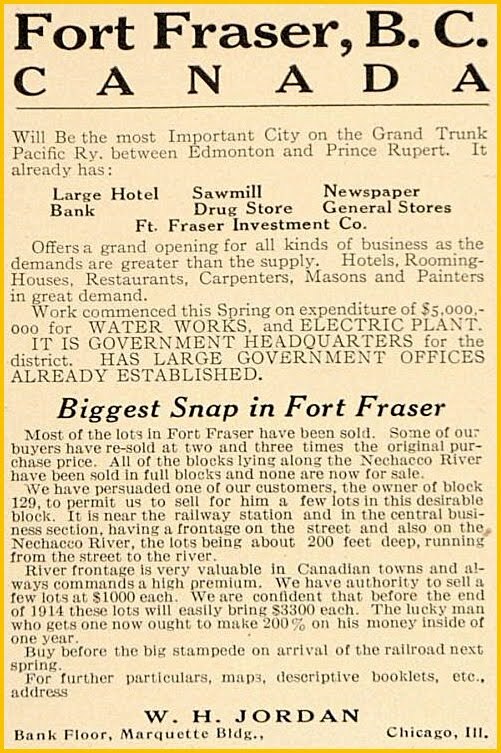 Fort Fraser Station was located on the Nechako Subdivision. It began at Prince George and ran 115.4 miles to Endako, B.C. Smack in the middle of the Northern British Columbia wilderness. 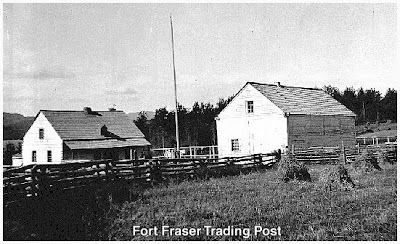 Curiosity drove me to learn how this small settlement and railroad station got the name "Fort Fraser." All I had to do was "Follow the Money!" This area was once the heart of New Caledonia, the name ascribed by Simon Fraser. His post with the North West Company was to explore the area to evaluate the commercial viability of establishing trading posts, to broaden the lucrative fur trade. Pelts were shipped "back east" to assuage the vanity of city folk in the form of hats and coats. There was no market for wolf or small animal pelts. Only beaver, muskrat and swan skins where deemed to have commercial value. The demand required tapping into large wilderness areas. In 1806, Fraser directed the construction of several trading posts - forts - one of which was located at the small aboriginal village of Natleh, at the eastern outlet of Kwa Lake. Operating margins must have been slim. Not only was it expensive, but also time consuming, to transport furs to Ottawa. An ordinary Northwest canoe, manned by five men, carries about 3,000 pounds, and seldom draws, when laden, more than 18 inches of water. Its average speed with the paddles in normal circumstances is about five miles an hour. A "portage" as the word implies, is a neck of land or other obstruction across which the canoe and goods were carried, usually by men, but, sometimes, horses are available. The bowman, on reaching a portage, leaps into the water to prevent the canoe from grating. Instantly then, slings are tied to the packages (" pieces ") in the canoe and the men walk off with their loads, and return for fresh ones. Some "portage's" were up to 100 miles! The usual weight of a "piece" is 84 pounds, and the strap, which keeps it in place, is broad in the middle and fits the forehead of the carrier. The journey from New Caledonia to Ottawa took an average of four months. Over time, Kwa Lake became Frazer Lake. Natleh became Fort Fraser. New Caledonia became British Columbia. Charles M Hays had a vision to see Prince Rupert, British Columbia, become the western terminus for a second transcontinental railroad. 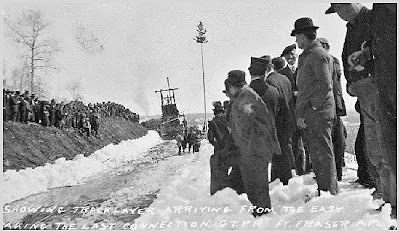 And in April, 1914, following seven years of construction, tracklayers of the Grand Trunk Pacific came marching into the area, one machine from the east, Fort George, the other from the west, Prince Rupert. Scurrying around each giant, mantis-like contraption - organized chaos! One can only imagine the cacophony of sound from steam whistles, ties rumbling along the conveyor system ahead of the machine, the steam winch dragging clanging rails forward to be lowered the ground, and the ringing of tie plates, spikes and angle irons! 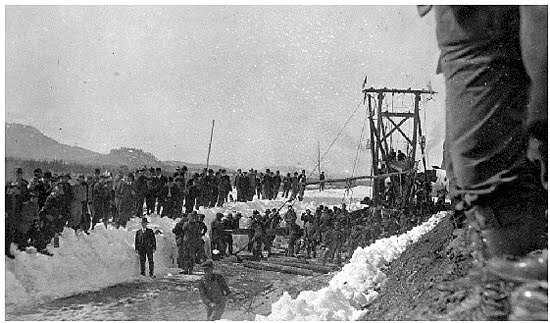 Work stopped momentarily as a gentleman by the name of RA Harlow, a surveyor for the Grand Trunk Pacific, and his team, established the finish point stake between the East and West crews - to race to the finish line. The West end crew cut and placed the last rail in place, after which Grand Trunk Pacific President Edson J. Chamberlin drove in the last spike at Mile Post 1372.7 (from Winnipeg.) There was no special spike. Just an ordinary black spike. From reading a number of documents, we know there were at least seven ceremonial spikes driven. I was only able to identify two other "spike drivers." Peter Titiryn, construction foreman for the "west crew," and Bartholomew Brosnan Kelliher, Chief Engineer of the Grand Trunk Pacific Railway. Most references to Mr. Kelliher are wrong, listing him as H.B. Kelliher. 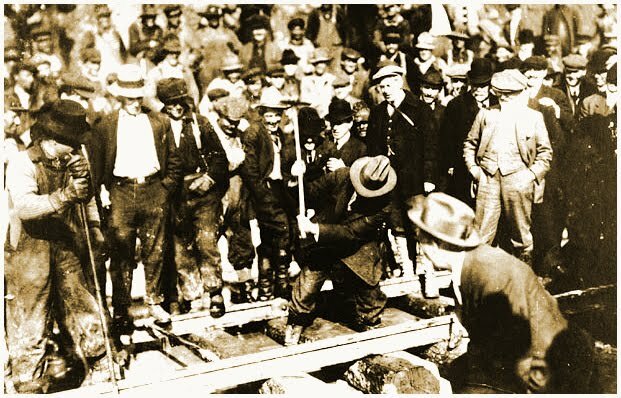 Mr. Kelliher was involved in several major railroad construction projects in the West. And there is a village named in his honor, located in Saskatchewan. 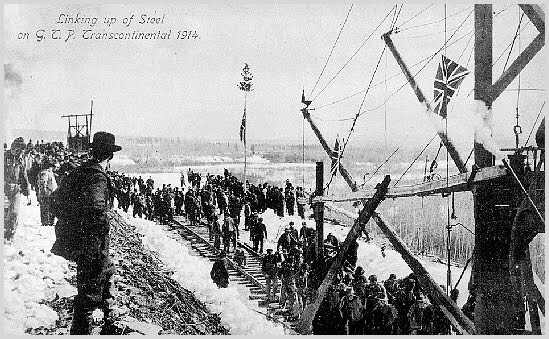 During a reenactment of the last spike in 1964, Jim Morris of Quesnel, one of the only two people present who actually witnessed the original last spike, said "he was amused at the repeated efforts needed to drive today's spike home, remembering that in the old days a "skookum" man could drive home a railway spike in two blows." 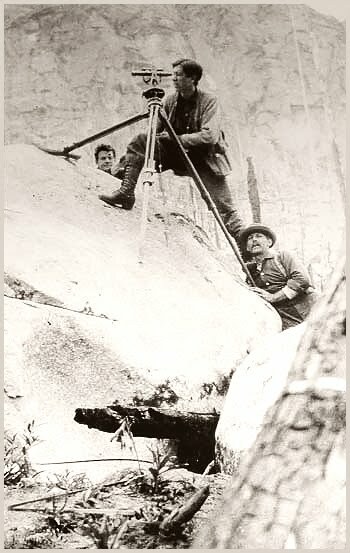 "Point of Completion April 7th, 1914." This rail was later sliced into quarter-inch-thick pieces, polished, suitably engraved, and distributed among railway officers as paperweights. One of those paperweights is on display at the Prince George Railway & Forestry Museum. Here is Mr. Harlow's first person account of his participation at the last spike. West End construction through the Rockies over the Yellowhead proved to be the most problematic. It has been noted that survey crews shot 12,000 miles of trial lines, to complete 186 miles of right of way. 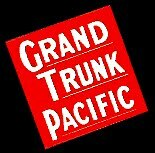 A preliminary summary of Grand Trunk Pacific's march to Prince Rupert, written by Chief Engineer BB Kelliher, was published in the May 1914 edition of Canadian Railway & Marine World. The estimated cost to construct the road from Winnipeg to Prince Rupert contains expenditures as reported by his staff, and expenditures as recorded by Collingwood Schreiber, from the Department of Railway Engineering in Ottawa. 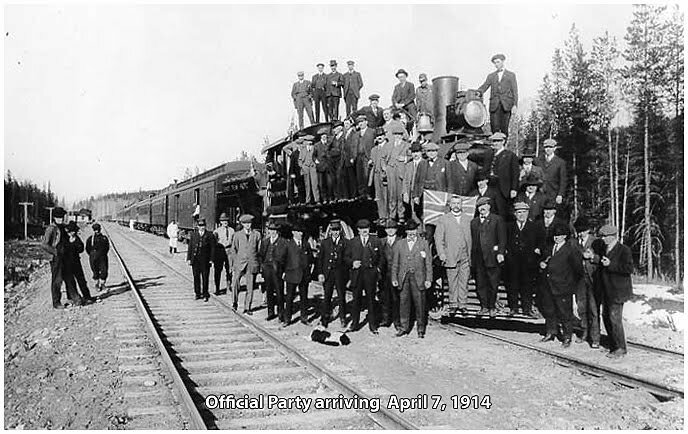 After the "dust had settled" and refinements to accounting ledgers and construction documents, the "First Construction Actuals - 1916" was reported in the Royal Commission to Inquire into Railways and Transportation. These were recorded as the "final construction costs." In 2010 dollars, about $2.3 billion dollars, or $1.4 million per mile. One immediately notices the date of the last spike in Kelliher's "official summary" is wrong! Like many of British Columbia's aboriginal peoples, the Takulli people (literally "the people who go upon the water") who inhabited Natleh - Fort Fraser - were wiped out by the smallpox virus brought by explorers. The Dakelh or Carrier are the indigenous people of a large portion of the Central Interior of British Columbia, Canada. The Nadleh Whut'en First Nations Carrier people, formerly the Fraser Lake Indian Band, still occupy their original living site at the east end of Fraser Lake. "Carrier" was assigned to the tribe because of their unusual practice that required a widow to carry the ashes of her departed spouse in a basket for three years following his death. One of the buildings of the original Fort Fraser sits at Beaumont Provincial Park, established at the Natleh village site. "The future of Rupert is even better than any other coast town. Not only will the voyage to the Orient be shortened by 473 miles, but the time across Canada will be shortened too, as the Grand Trunk Railway throughout most of its length has a grade of four-tenths of one per cent, making it the best railway on the American Continent, with the possible exception of the Pennsylvanian road in the United States." 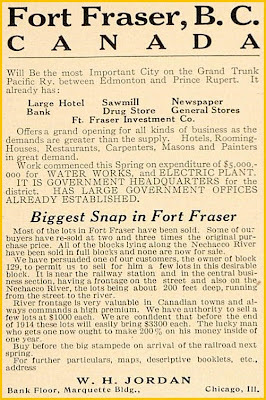 Today, while there is no station at Fort Fraser, in its own way, transporting wheat, coal, and container trains out to Prince Rupert, the Canadian National continues to achieve the vision of Charles Hays, who never got to experience the joy of seeing his dream come true. "John Tod: Career of a Scotch Boy" edited by Madge Wolfenden, British Columbia Historical Society, 1954. Detailed first person account of exploration for Hudson Bay Company. "A Thousand Blunders: The Grand Trunk Pacific Railway and Northern British Columbia." What a wonderful article- Makes learning about the wonderful history of British Columbia come alive. Your thoughtful attention to detail is apparent in all your writings. Well done. Thank you!